In mid 2008 a group of three SAC year 8 girls who had swimming backgrounds, decided they wanted to play a team sport involving water….so they discovered waterpolo, and started up a school waterpolo team. 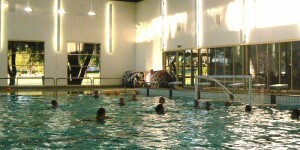 In mid 2008, wanting more waterpolo fun and experience, they discovered the brand new Eastern Saints club. With great excitement and enthusiasm they joined, becoming the FIRST girls to do so. Even though they were still new to the sport, their hard training was rewarded, by being chosen to represent SA in the East Coast Challenge in July 2008 in Melbourne. It was a steep learning curve, but the girls represented their club and their state with pride and dedication against the strong level of competition and experience of other state teams. On their return, the girls encouraged their friends and families to join in, and by the late 2008 Eastern Saints had entered a mixed U14 and B Grade women’s team for the first time in its short history.The girls were also chosen for the ECC 2009, in Sydney and continue to be active members and leaders in the club in 2009, often supporting and mentoring younger less experienced and new players to the sport. Slowly more females are realizing what an exciting and fun sport waterpolo is, and our numbers have been increasing. Our goal as a club is to have a strong membership of females as well as males across all the age ranges, and to continue to grow in skills and abilities as well as in membership numbers. Part of the recently created position of SAWPI Chief Executive Officer which I have undertaken, I have, under the direction of the SAWPI Board, endeavoured to provide a more attractive, marketable product within the current club frame work of SA Water Polo. To this end a 4th club was established during the 2007-8 season. It is hoped that with the advent of a 4th club, the local competition will benefit from an increase in the number of people playing, the quality of competition and the integration of players from the current schools competitions to the SAWPI clubs. The club, known as the ‘Eastern Saints’ is based in the northern end of the eastern suburbs of Adelaide and has schools and swim clubs in the North Eastern metropolitan corridor as its feeder network. With St. Peters College pool as its home training base, quite obviously the club will have strong links with the Saint Peters College and Saint Peters Old Collegians Water Polo fraternity. The concept has been embraced enthusiastically by SA Water Polo and the Department of Recreation and Sport, who have generously provided financial support over 3 years to assist the 4th club concept to grow. As the CEO of SA Water Polo I am committed to the growth and development of the Eastern Saints and wish to acknowledge the support of the following people. Mr Paul Hadfield and Mr Daniel Ganama c/o St. Peter’s College.